Meet Faith, whom Camp Cocker Rescue saved yesterday from the shelter in Riverside county, CA. This poor senior gal was clearly used for breeding her whole life and she's exhausted. Her skin is terrible, to the point where she is non stop scratching and itching and trying to chew on her own skin. 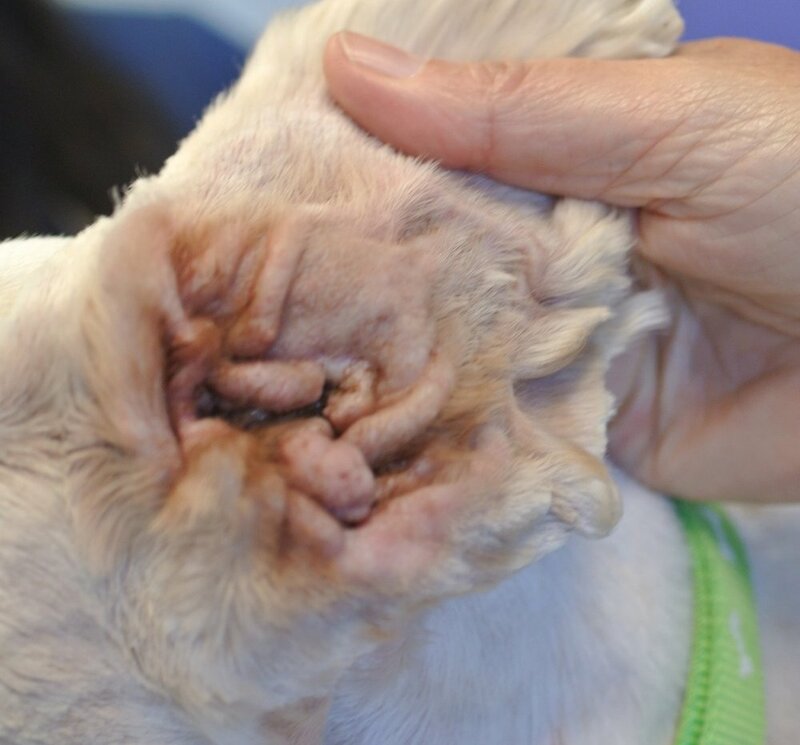 Her ears are so calcified from untreated lifelong ear infections that the canals feel like cement and she has tumors of calcification growing out of both closed ear canals (she will need double ear ablation surgery). She needs a dental and extractions, her mouth is red from inflammation and infection. Her eyes are red and bloodshot and she needs eye meds to help get her some comfort. Needless to say, this girl has a long list of everything that needs attention and is going to quickly run up our vet bills significantly. Please consider making a small donation to Faith today to show her that there are humans who care about her? Thank you so much for being a part of the rescue village Faith is going to be needing! We have seen many used up Breeder Dogs come through our rescue over the years and our hearts break each time at the condition they are left in. Discarded. Disposable. Abandoned. We can see what her past was like - but we can also see what her future holds: And it is BRIGHT. WARM. FULL OF LOVE. 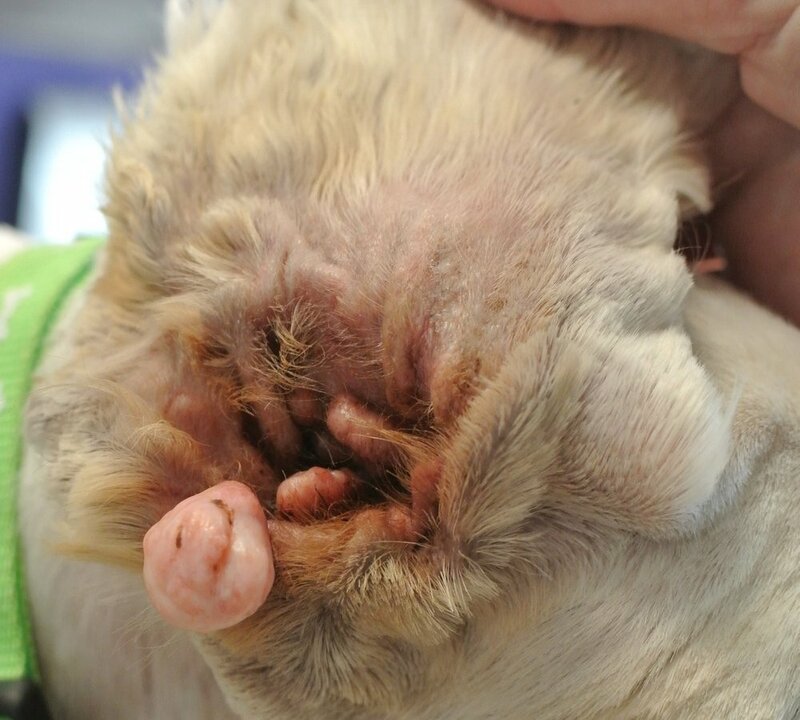 Please consider donating towards Faith's double ear surgery, oral surgery, and medicated baths. This girl is in for a lot of work, but when it is done it will be all so worth it. Yes, i gotta have faith! One ear down - One to go!! Please follow us on FACEBOOK for our LIVE UPDATES on our dogs!